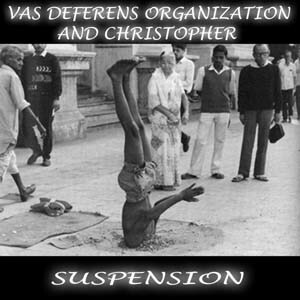 Vas Deferens Organization And Christopher - "Suspension"
VDO's latest was actually recorded in 1997, their second collaboration with Christopher Moock (I haven't heard the first, Miasmate). This LP-only release dispenses with tracks and song titles, being content to drag the listener through a continual torrent of patented VDO psychedelia-from-hell by simply naming each side of the album "Up" and "Down". On Suspension the main actors, along with Moock, are longtime VDO'ers Matt Castille and Eric Lumbleau. For the uninitiated, VDO is, on one level, one of the most cosmically psychedelic bands around. However, there's a flipside on which the members are collectively passionate about the most diverse styles of music ever created. Krautrock and various avant-garde influences are as likely to make their way into the same stream flowing into the listener's brain as anything, and studio manipulation is key to the results. In fact, these guys glom together so many layers, and mix it all so lovingly, that a decent sound system, and most certainly headphones, are about the only way you're going to really get a handle on everything that's happening. So what do we hear on Suspension? EVERYTHING! Freaky drones of varying pitches that sound like a race car accelerating and decelerating along with Suspiria witch screams, Faust meets the Residents styled constructions, and cosmic looped madness. Bubbly acoustic guitar and electronics that recall the psychedelia of Dave Tor's Mynd Muzic. Haunting ambient atmospherics that are too unsettling to be meditative. And amidst the chaos, diehard electronica fans will find a banquet of impressively structured sounds, patterns, textures, and effects. Is the chaos controlled? Well the music is clearly traveling down a determined path. And... well... it sounds cool! Some of VDO's music is not for the faint-hearted, though Suspension will easily appeal to space and psych fans that have a taste for the avant-garde. Krautrockers into Faust and Can's more adventurous moments will find much to like here as well. For more information you can visit the Vas Deferens Organization web site at: http://www.vdostudios.com. Suspension is distributed by Beta-Lactam Ring Records. You can visit their web site at: http://www.blrrecords.com/.